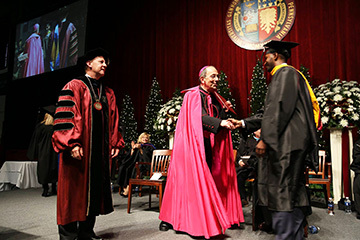 Gannon University will be handing out 178 degrees at Winter Commencement Sunday. At least 150 students of the total 178 are expected to walk. 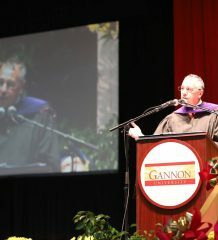 Gannon’s Winter Commencement will be held at 2 p.m. in Hammermill Center, located in the Waldron Campus Center. All graduates are expected to assemble in Club LaRiccia in the lower level of the Beyer Hall Cafeteria at 1 p.m. before the ceremony begins. Mayor Joe Schember is scheduled to be a guest speaker at the ceremony. At the ceremony, each graduate will be announced by name, a personalized touch Gannon has held onto. As done in previous years, all in attendance will be asked to stay in their seats. This rule is geared toward both guests and fellow students to ensure respect for all graduates. This also allows each graduate a special moment of recognition. This policy also applies to asking audience members to avoid approaching the stage to take pictures during the ceremony. Once the recessional has ended with the graduates leaving, friends and family will be allowed to return to the stage to take pictures. There will also be professional photographers in attendance. They will photograph all graduates as they walk across the stage and receive their diploma. A video of the ceremony will be available for purchase. Each graduate is allowed an infinite number of invites, differing from previous ceremonies. Seating will be done on a first-come, firstserved basis for all graduation events. No tickets are required for the ceremony or any other events going on during the weekend. Donoven Chase, a senior history and political science major, said he will be walking on Sunday. He will be graduating a semester early after deciding he did not want to spend an additional semester at Gannon since he had completed the credits necessary to graduate. “It’s for my family, not for me,” Chase said. Once he graduates, he will be working until he begins graduate school next fall. Similarly, Kate Robb, a senior history major and fellow graduate, is leaving school a semester early. She said she will be taking some time to travel before starting her degree-related work in May. “I am looking forward to graduation because I know afterward, I will have a bit of a break before my next true commitment begins in May,” Robb said. Before attending graduate school, she will serve two years with Teach for America in Charlotte, N.C.
Robb plans to pursue a master’s degree in education at the University of North Carolina. “And then, who knows from there!” Robb said. Before then, she will see her family at graduation as she walks across the stage. Other events held that day include an ROTC Commissioning Ceremony at 8:30 a.m. in Room 219 of the Waldron Campus Center. A baccalaureate Mass will also be held at 11 a.m. in Mary, Seat of Wisdom Chapel, 520 Peach St., to celebrate the university community. 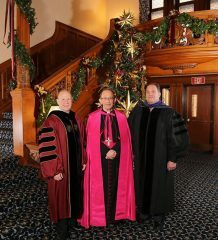 Gannon graduates, family and friends are invited to this liturgy. Neither of these events requires tickets. Immediately following the commencement ceremony, a reception will be held in the Yehl Alumni Room of the Waldron Campus Center.